My dad, Bill Pickens, is a practical movie watcher. 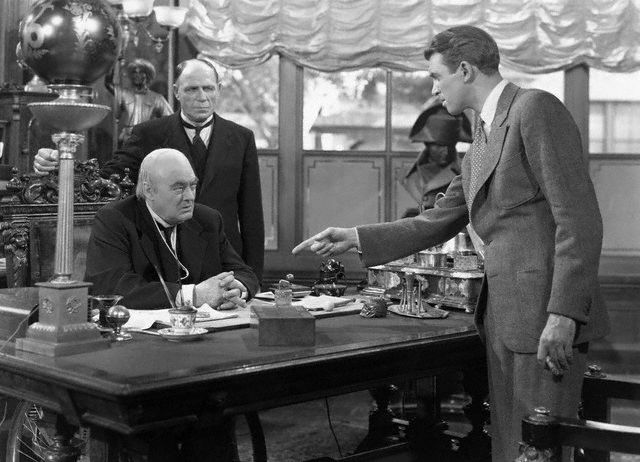 When Uncle Billy in “It’s A Wonderful Life” (1946) loses the check that would save George Bailey’s bank, my financially responsible father is furious. In mystery films, he is always trying to figure out the plot twist or who-done-it before the movie is over. Maybe it’s because he’s an engineer. 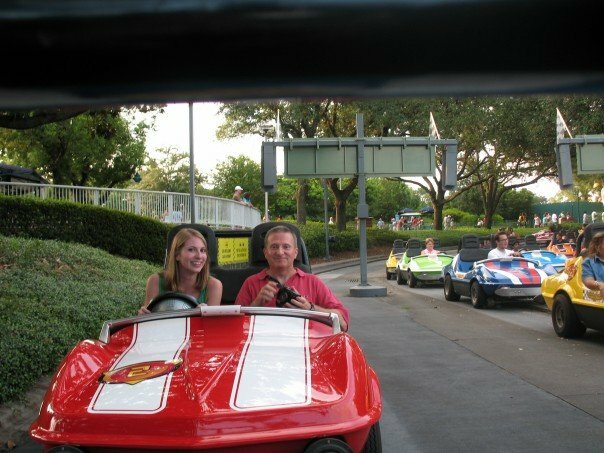 But along with teaching me to drive, helping me with long nights of math homework and moving me into new apartments in college and for jobs, my dad has always been supportive of my classic film watching. Classic films are what my parents grew up on and in return, showed my sisters and me when we were young. It was even my dad who suggested that I watch “West Side Story” (1961) in 2003 since I was starting to show an interest in musicals. But without my dad suggesting that film, I wouldn’t have gone on to see 502 musicals. Whenever I’m home, my mom, dad and I pick out a classic movie to watch together in the evening. I try to pick out one I didn’t want to watch without them or that I feel everyone would enjoy. My dad has been a pretty good sport over the last 10 years with my selections. He has sat through frothy musicals such as “Luxury Liner” (1948) starring Jane Powell and even sat through Doris Day’s last and probably worst film “The Ballad of Josie” (1967). Another time my mom and I had him watch the smutty 1950s film “A Summer Place” (1959) starring Sandra Dee and Troy Donahue. 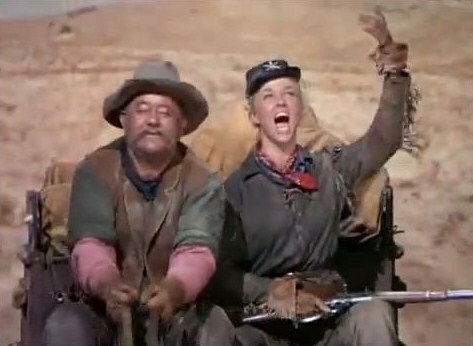 One of the only movies he has ever snuck out on and never returned was “Calamity Jane” (1953). I think it was the rather long song “The Deadwood Stage” that starts as soon as the movie begins that drove him from the room. I guess I don’t blame him. But my favorite movies to watch with my parents are World War II films and thrillers. We all seem to enjoy those. Films like “Battleground” (1949), “The Longest Day” (1962), “Thirty Seconds Over Tokyo” (1944) and “Objective Burma” (1945) are some of our favorite war films. Alfred Hitchcock, John Wayne movies and live action Disney films are more of our favorites. Some of dad’s other favorite films are “Lawrence of Arabia” (1962), “TThe King and I” (1956) and “To Kill a Mockingbird” (1962). I guess I’m a pretty terrible daughter. After my dad has watched everything down to “Gold Diggers of 1935” (1935) and “Rose Marie” (1936), I have never seen “Lawrence of Arabia.” I guess well have to watch that sometime. I call my mom the agent of my blog Comet Over Hollywood, because she proof reads everything and listens to my ideas. But my dad has helped out with my film interest as well. In 2006 we went on a family vacation to Hollywood to tour studios such as Paramount and take pictures of the hand prints in the cement outside of Grauman’s Chinese Theater. Recently when I was traveling again to Hollywood for the Turner Classic Movies Film Festival, my parents drove me two hours to the Atlanta airport. Atlanta was a straight flight to Los Angeles and they worried about their youngest child making a connecting flight. When I was a child, I don’t think my parents had any idea what sort of film fanatic they were creating as they introduced us to old movies, but I don’t think they mind. Check out the Comet Over Hollywood Facebook page for the latest updates or follow on Twitter at @HollywoodComet. 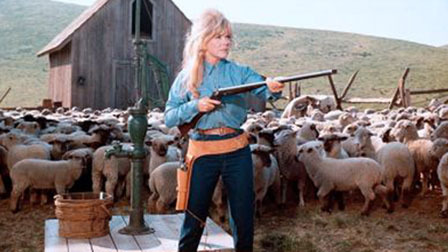 This is December’s edition of Comet Over Hollywood’s classic film references in music videos. Going with the Christmas season, is the song “Have Yourself a Merry Little Christmas” played by Kenny G in 1997. Though I’m not a Kenny G fan, I have to admit this is a very heartwarming video. It stars classic film star Burgess Meredith, who’s career ranged from “Idiot’s Delight” (1939) to his role of the Penguin in the 1960s Batman TV show. Meredith appears to be a projectionist at a movie theater who is sad, lonely and missing his family at Christmas. He reminisces on past Christmases by watching clips of classic holiday films such as “Meet Me in St. Louis” (1944), “Miracle on 34th Street (1947), “It’s a Wonderful Life” (1946), “Little Women” (1949), “A Christmas Carol” (1938) and “Bells of St. Mary’s” (1945). Meredith was 90 when this video was filmed. He died that same year of melanoma and Alzheimer’s disease, making this video a little more heartbreaking than it already is. The song's single cover channels "Citizen Kane"
Right on the heels of watching “It’s a Wonderful Life” (1946) in Mount Airy, I want to share a reference of the film in The Killer’s 2010 Christmas single “Boots.” It was the fifth Christmas single the band wrote to help raise money for AIDS. The video starts off with George Bailey (Jimmy Stewart) praying for help in “It’s a Wonderful Life” right after the $8,000 is lost and he thinks he is going to jail. The song also mentions the movie title in the chorus. 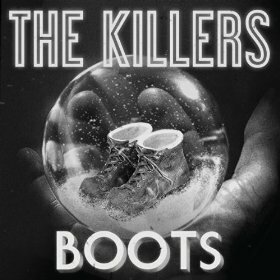 The cover of the single also references “Citizen Kane.” The snow globe with the boots inside is similar to the snow globe Charles Foster Kane is holding when he dies. “Boots” was directed by “Napoleon Dynamite” director Jared Hess and the homeless man in the video is street performer Brad “Super Bad Brad” Prowley- I had no idea he was anyone well-known until a today. Most of the band’s Christmas songs are silly and fun, such as “Don’t Shoot Me Santa Claus”, “Great Big Sleigh” and “The Cowboy Christmas Ball.” However, this video is about home, memories and is a bit more serious and sentimental. I believe this might be, because Flowers’ mother passed away in February 2010 and he was dedicating it to her and childhood memories, though this is just an assumption. As most of you know The Killers are my favorite band. In past classic film in music video posts I have shared their videos “All the Things I Have Done” and “Bones.” From what I have heard in interviews and read in articles, I feel like lead singer Brandon Flowers appreciates the old times and classic film. He was raised in Las Vegas and tries to channels the Frank Sinatra, Dean Martin and Elvis days of 1960s Las Vegas in his performances and music. Tonight I had my third classic film on the big screen experience- and I have to add it might be my favorite thus far. I drove roughly 30 minutes with fellow Elkin Tribune reporter, Kristin Zachary, to see “It’s a Wonderful Life” (1946) in Mount Airy, North Carolina. Some of you may recognize Mount Airy as the town the television show “Andy Griffith” is based off of. The town is full of Andy Griffith related places such as the Andy Griffith Playhouse/mall/Parkway, Opie’s Candy Store or Barney’s Lunch Counter-but I digress, that is another post. 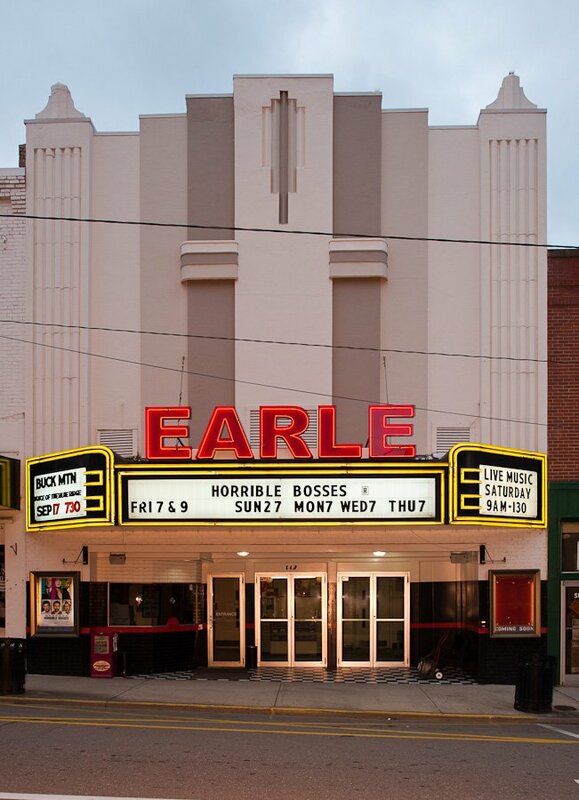 The film was showing at The Earle Theater, built in 1938 and opened in time to show “Gone with the Wind,” according to the Mount Airy News. I can’t tell you when the last time I had watched “It’s a Wonderful Life.” Though my family owns it, it isn’t a Christmas movie we watch every year like “Charlie Brown’s Christmas,” “Bishop’s Wife,” “Christmas in Connecticut” or “White Christmas.” I think part of the reason we don’t is because my dad gets very, very angry when Thomas Mitchell loses the money. I had forgotten what a good movie it was, but then it’s a Frank Capra film so it’s pretty much flawless. For those who haven’t seen the movie, the film is about George Bailey, played by Jimmy Stewart. He is in a bad place in his life, and his guardian angel comes to help. Before coming down to Earth the angel looks back over George’s life- reviewing events like saving his little brother from drowning, the death of his father and getting married. 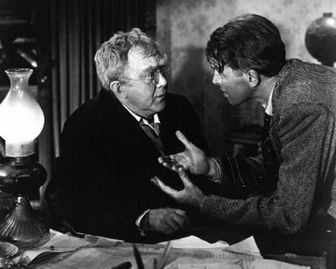 We see the struggles George Bailey has gone through for his family and how he has had to set aside everything he wanted in life to help everyone else out-mainly to keep his father’s business out of greedy Mr Potter’s hands. Before being visited by his guardian angel, he feels like he has reached the end of his rope and everything he has worked for has been for nothing. 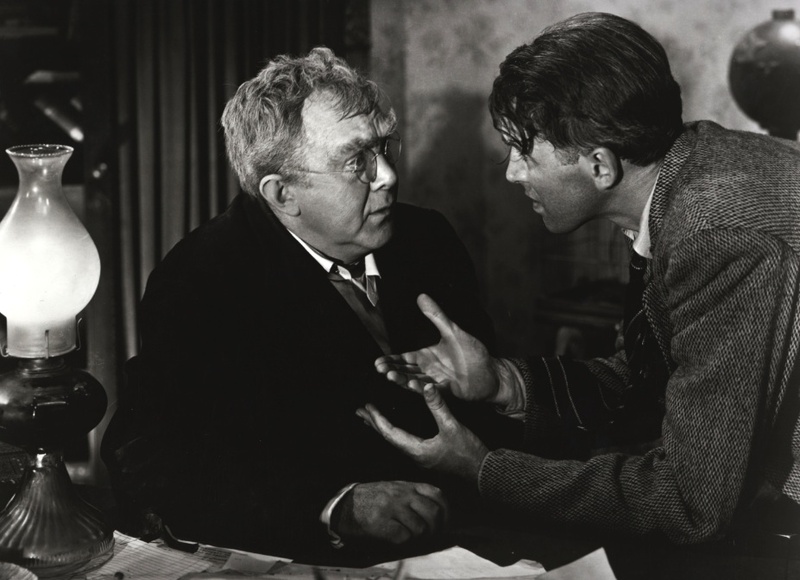 Bailey wishes he was never born and Clarence the Angel (played by Henry Travers) shows him what Bedford Falls would be like if Bailey hadn’t been born and how much he has affected everyone around him. We meet grown up Mary (Donna Reed) for the first time. Capra has some great camera shots. Most of my favorites were toward the end when George Bailey (Jimmy Stewart) hasn’t been born such as when childhood friend and local hussy Violet (Gloria Graham) is being arrested- the camera is in her face as she is struggling with the cops. Another shot is the close up of George Bailey’s face as he is frantically looking around Pottersville/Bedford Falls. Other shots I liked were at the graduation dance with the close up on Mary (Donna Reed) when George first sees her after many years and ( also at the graduation dance) when the two boys (one being Carl ‘Alfalfa’ Schwartz) are planning to open the swimming pool floor. -The last time I saw “It’s a Wonderful Life” I was probably in late elementary school or in middle school. Sometimes I didn’t understand why George was upset with how his life was going. Now that I’m out of college and have my own ambitions, I can relate to him a lot more. George yelling at Uncle Billy for losing $8,000. -Thomas Mitchell (who played Uncle Billy) broke my heart. He was so sweet and forgetful and didn’t mean any harm to anyone. I almost died at the part where George is yelling at him and calling him a stupid fool for losing the money and then….Uncle Billy cries….and a squirrel jumped on his arm-further tears from me. I understand being upset over the loss of $8,000, but who sends the absent minded relative to the bank with that much money? 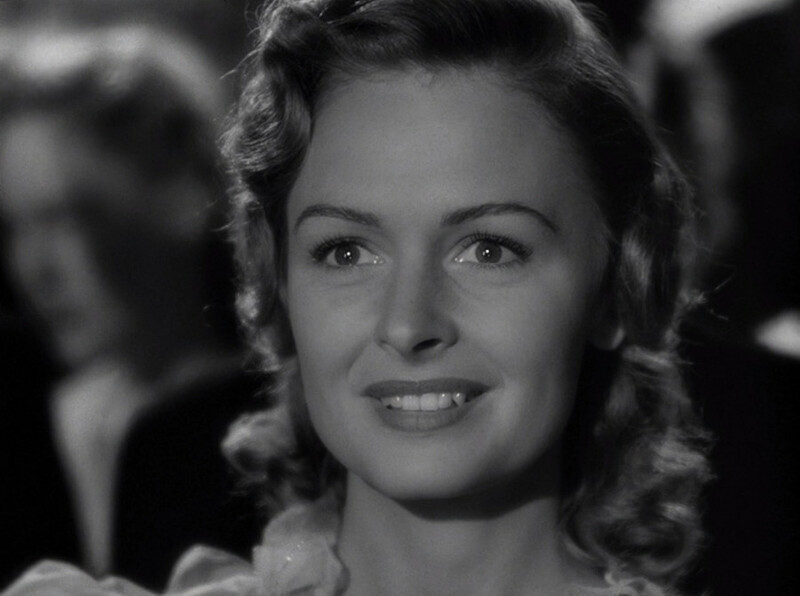 -I always knew Donna Reed (who plays Mary) was a good actress, but I was really impressed with her acting in this movie. Unfortunately, she wasn’t given the chance at MGM she deserved, because many roles that might have gone to her, went to June Allyson. -Gloria Graham (who plays Violet) isn’t one of my favorite actresses, but she also does a great job in this movie. It may be my favorite role of her’s. Lionel Barrymore, as Mr. Potter, is the richest, greediest man in town. -Lionel Barrymore is my favorite of the Barrymores and he sure can play a good bad guy. Barrymore plays Mr. Potter who is the richest man in town, greedy and wanting to have control everything. However, is anyone else bothered by what looks like a bald cap on Mr. Barrymore? -I never realized how many funny parts were in this movie, either. Kristin and I were cracking up the whole time, particularly because a little boy with a really funny laugh was sitting in front of us. Every time he laughed at the funny parts, we would laugh harder. 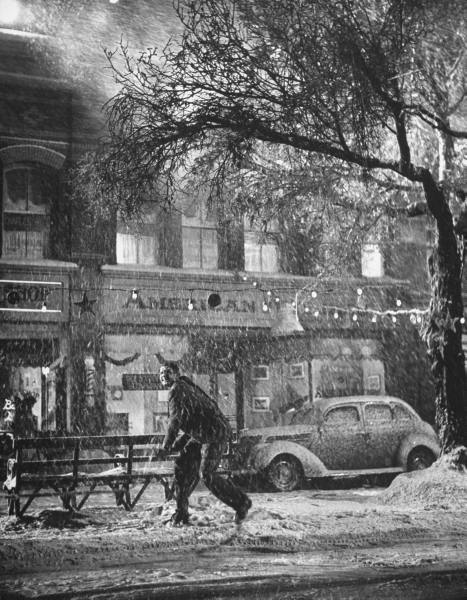 George running through the streets of Bedford Falls thankful to be alive. Overall, the uplifting film mixed with the small town ambiance of Mount Airy, it was a very lovely experience and is my favorite classic film experience thus far.